Holi is basically an Indian Festival which is celebrated in Spring season. 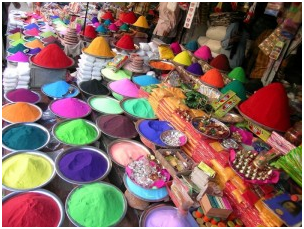 It is also known as the festival of colors and fun. It is a traditional Hindu festival, though very popular in other religions also.It is commonly celebrated in India, Nepal and other regions of the world with significant populations of Hindus, or people from Indian origin.But because of its colour filled celebration, it is now also being celebrated in many parts of Europe and North America. In India, Holi is basically celebrated in Gujarat, Uttar Pradesh, Uttarakhand, Bihar, Bengal, Odisha, Assam, Goa, Maharashtra, Manipur, Karnataka, Kerala, Haryana, Andhra Pradesh, Madhya Pradesh and Tamil Nadu. First and foremost, it marks the beginning of the new season, spring and many people believe that it is a time of enjoying spring’s abundant colours and saying farewell to winter. Holi festivities mark the beginning of the new year to many Hindus, as well as a justification to reset and renew ruptured relationships, end conflicts and accumulated emotional impurities from the past. It also has a religious importance, symbolically signified by the legend of Holika. 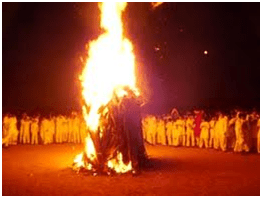 The night before Holi, bonfires are lit, known as Holika Dahan or Little Holi. People gather near fires, dance and sing. The next day, Holi, also known as Dhuli in Sanskrit is celebrated. Children and youth spray coloured powder solutions known as Gulal at each other, laugh and celebrate, while elders tend to smear dry coloured powder known as Abir on each other’s face. Visitors to homes are first teased with colours, then served with Holi delicacies, desserts and drinks.After playing with colours, and cleaning up, people bathe, put on clean clothes, visit friends and family. The legend of Prahlad and Hiranyakshyap. depicts the religious significance. The legend says there once lived a devil and powerful king, Hiranyakshyap who considered himself a god and wanted everybody to worship him. To his great ire, his son, Prahlad began to worship, Lord Vishnu. 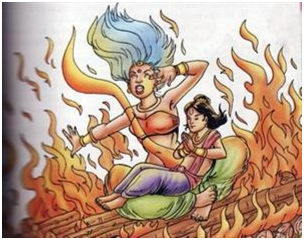 To get rid of his son, Hiranyakshyap asked his sister, Holika to enter a blazing fire with Prahlad in her lap, as she had a boon to enter fire unscathed. But instead what happened was that Prahlad was saved for his extreme devotion for the lord while Holika paid a price for her sinister desire. The tradition of burning Holika or the ‘Holika dahan’ comes mainly from this legend. Apart from this, this festival of colors helps to bring the society together and strengthen the secular fabric of our country. People forget their mutual differences and wholeheartedly celebrates this colorful festival. Sometimes this joyous festivals takes a bad shape because of the synthetic colors used these days to celebrate it. These synthetic colors cause skin irritation because of industrial dyes present in them. So its better to play holi with turmeric powder or with sandalwood paste. Moreover prefer playing a Dry Holi in order to prevent the wastage of water and to preserve the spirit of the festival.